I’m back on the road after a long hiatus here in the Pacific Northwest. And I’m excited that my literary travels are taking me to Virginia – the tenth state to enter the union. Specifically, I’m going to Charlottesville to visit the oldest bookstore in Virginia. The New Dominion Bookshop opened in 1924 and is now located in the historic downtown mall. The online photos intrigued me and, when I learned that the shop was hosting the twenty-fifth annual Festival of the Book on the very weekend I found them, I wished I could transport myself there and take part in what appears to be a bibliophile’s dream. Instead, I had to be content with leaving a voicemail and getting a call back from a bookseller, Sarah, the next day. They were very busy. Had I been able to physically travel to Charlottesville, I would have attended the workshop that weekend on Southern Literary Fiction, which included two native Virginia authors: Talley English and Krysten Lewis. Instead, Sarah suggested I read Krysten Lewis’s latest novel, Half of What You Hear, set in the fictitious town of Greyhill, Virginia. I guess I’ll have to content myself with learning about contemporary life in small-town Virginia that way. Moving on to Virginia historical fiction, I could read William Styron’s The Confessions of Nat Turner, but there’s some controversy around that book now and maybe Edward Jones’s, The Known World is a better pick. Also, Barbara Kingsolver has lived in Virginia for some time and her novel, Prodigal Summer might also be a good choice. And what about Annie Dillard’s, Pilgrim at Tinker’s Creek, a kind of modern-day Walden experience? Looks like I have many good choices. But I’m getting ahead of myself. Back at the New Dominion Bookshop website, I learned that a long-time owner of the shop, Carol Troxell, loved gardening and planted a rose garden behind the bookstore. Apparently, the once unsightly alley has now become a favorite stop on historic Charlottesville tours. 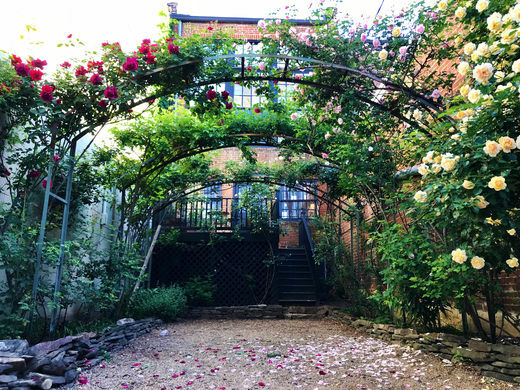 I can see from the photos that the roses are gorgeous – especially the climbers that grow over the arched French trellises connecting two old brick buildings. A profusion of red, pink and yellow roses cascade over the trellises and bloom every May. Their perfume must be heavenly. I also like the way that New Dominion supports its literary community. Every Thursday night, students in the University of Virginia’s MFA program read from their work – one poet and one prose writer each time. On the last Friday of each month, other young writers and poets read from their work. The UVA Charlottesville Book Club also meets regularly at New Dominion. And the shop hosts a number of author readings, book-signings and launches each month. I’m especially intrigued by this service that New Dominion offers: Dedicated to creating a personalized experience for our customers in-store and out, we’ll collaborate on curating the perfect library completely tailored to you. Mostly, what I like about this bookstore is how it feels in the pictures – warm and inviting and stacked floor to ceiling with books. Stay tuned for my reviews.